A turkey cooked in Mole Sauce is a delicious option for Thanksgiving dinner. This is the recipe Nichols Garden Nursery uses with Mole/Poblano Pepper seed. It is a simple traditional mole sauce. The Mole Pepper is a typical elongated semi-spicy Pasilla type pepper. As they mature the color changes from green to chocolate brown. Seed starters should think about getting peppers into a starting mix the month of March and keep the sown seeds warm until germinated. As soon as you see sprouts remove from bottom heat. Moles often include chocolate and a mixture of peppers, spices, broth and are delicious with poultry or pork, serve over rice or fold into burritos. Try this recipe and don’t be afraid to add a few other peppers to smooth out the heat or jack it up to your standards. You can make large batches to freeze. Heat oil in a large skillet, add onion, garlic, pepers and raisins. Saute’ until onions are slightly transparent. Stir in remaining ingredients and simmer 20 minutes. Puree sauce in food processor or blender until smooth. For chicken, turkey or pork mole, add precooked meat to sauce. Serve with rice. This sauce without added meat freezes beautifully and it’s worthwhile to have several pints stocked away. One year we made a fantastic roast turkey basted with mole, defatted and cut into joints and bathed with more mole.A fantastic holiday meal! This recipe we’ve made since first growing yacon and we keep returning to it. 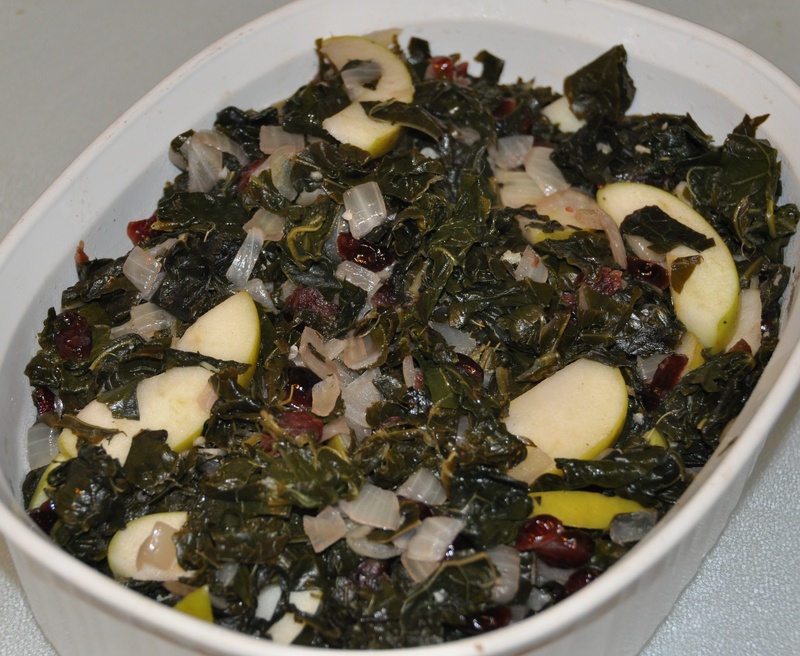 An easy fresh and unusual winter salad it’s a novel addition to the Thanksgiving table. Peel and slice the pineapple into eight sections making longitudinal cuts. Remove the core and slice the pineapple pieces into ½” thick wedges. To peel yacon, a standard potato peeler does a good job and doesn’t cut too deeply into the tuber. You can trim with a knife. Rinse when peeled. Yacon peel is bitter so peeling is always recommended. A food processor with a medium shredding disk produces larger shreds if you press down firmly on the feed tube. 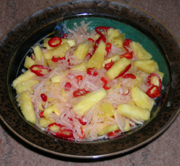 Immediately add lime juice to shredded yacon to prevent discoloration and then combine with pineapple and peppers. The tiny pepper rings in this photo are from Nichols new Baby Belle Sweet Pepper. A few shredded leaves of fresh spearmint is a good variation. If you choose to use canned pineapple chunks select two 16 oz. cans that are lightly sweetened with juice drained. Note: a Mandoline produces a perfect julienne but watch your fingers, the blades are sharp and no one wants to see blood in the salad. I usually peel the yacon, cut into large chunks, and press firmly down as it goes through shredder on my food processor. Our traditional stuffing. For Thanksgiving we use cornbread, the grain of America. Stuffing needs to be tasted and seasoned as you prepare, a reason to not use raw eggs. Hold back on the salt as the natural juices of the bird and sausage add sodium. This recipe makes 4-5 quarts of stuffing. The rule of thumb is ¾ cup of stuffing per pound of turkey. A 15-pound turkey holds 11-12 cups. Bake extra stuffing separately adding broth. Sunflowers are native to North America and have been cultivated for thousands of years. Used for snacks and cooking, the seeds are one of our best sources of Vitamin E.
To prepare cornbread, use your favorite recipe or cornbread mix and cook according to directions. If you can find a cornbread stuffing mix that is not overly seasoned use it. * When cool crumble onto a two large cooking sheets and place in a 200-degree oven for 30 minutes. Remove from oven and stir well and let cool. In an extra large skillet begin slowly cooking sausage, stirring occasionally and breaking into small pieces. While sausage cooks chop onions, celery and mushrooms. If celery leaves are in good condition include them. Melt butter in skillet with sausage and add chopped vegetables. Over medium heat sauté until onions are translucent and add seasonings. In a small skillet melt butter and add sunflower seeds, stir them about until lightly toasted. Combine all the ingredients in your largest mixing bowl, including cranberries. This makes a fairly dry stuffing if you prefer one that is moist add broth. Taste and adjust seasonings. Stuffing can be made a day ahead and refrigerated. 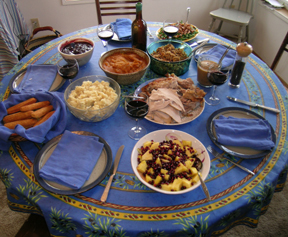 Remove from refrigerator an hour before using as extremely cold stuffing will slow the cooking time of your turkey. It is recommended that turkey thigh temperature be 180 degrees and interior of the stuffing be 165 degrees for turkey to be considered done. I find *Mrs. Cubbison’s seasoned cornbread is lightly and pleasantly seasoned. Three boxed provide the amount needed for this recipe. Since it is very dry you will need to add broth, if you can only find highly salted broth use white wine or apple cider. The best cornmeal for this recipe is medium grind stone ground. It will give you a combination of floury particles and larger ones with a bit of crunch. If you can’t find it use regular yellow corn meal. This recipe will also bake in a 9” cast iron skillet or baking dish. When baking the gluten free version in a pan or skillet I recommend a thin layer of batter. The corn stick molds are charming and this is a good excuse to use them. Use actual oil to grease the molds, I once tried non-stick spray and the batter stuck like glue. This recipe fills two molds making 14 corn sticks. My husband, Keane, likes to add a finely chopped, deseeded Jalapeno or Serrano pepper. The original recipe below calls for 1/4th cup of flour. After some experimentation for a gluten intolerant friend I learned it makes excellent cornsticks by making the following changes. Delete the 1/4th cup of flour and add 2 tablespoons ground flaxseed. Next reduce buttermilk by one tablespoon. If gluten is an issue make these corrections. Set oven rack in middle of oven and preheat to 425 degrees F. Oil and preheat seasoned corn stick pans for ten minutes. Take a medium mixing bowl and add in cornmeal. Add sifted flour, baking soda, baking powder and salt. Stir to combine dry ingredients. Lightly beat eggs and combine with buttermilk, oil and corn. Remove corn stick pans from oven and using a brush lightly oil the molds. If excess oil gathers in the bottom use a paper towel to wick it away. Quickly fill molds with 2 to 3 tablespoons batter and bake for 15 minutes. Remove from oven and let rest for 2-3 minutes before removing from pan. Use a small sharp knife blade to gently loosen edges These are at their best served fresh from the oven. If you are preparing ahead, cool on a wire rack and freeze well wrapped sticks. Reheat on a cookie sheet at 350 degrees. Lightly oil skillet or baking dish if not using molds. This rich and decadent pie combines some of the great flavors of the Southern US and Central America. Pecans are the state trees of Texas and native to the US, chocolate and vanilla come from Mexico. We use the classic Karo corn syrup which is not high fructose. A hint of hot pepper adds warmth and depth of flavor for a delicious ending to a festive meal. Serves 10-12. For the crust: use one frozen or refrigerated pie crust or your favorite recipe. Preheat oven to 400 degrees F. Line a 9” or 10” pie plate with crust. Partially bake crust for 7 minutes. Remove and set aside, if any areas have bubbled up gently press down with the back of a fork. Reduce oven temperature to 350 degrees. When pecans have cooled, break them into small pieces. If you are working with pecan halves, set 12 perfect ones aside for garnishing. Place pecan pieces in a large bowl add chocolate chips and flour and toss until chips and nuts are coated. Use your mixer or food processor to mix filling ingredients. Place butter and brown sugar in container and cream until light and fluffy. Add milk and then add eggs, one at a time so that each is completely incorporated before adding the next. Add vanilla, corn syrup, salt and cayenne and beat until evenly mixed. Pour this egg syrup mixture into bowl with the nuts and chocolate. Stir well until combined. Pour mixture into the partially baked crust. 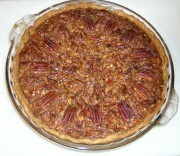 Place reserved pecan halves on top of filling evenly spacing. Set pie on rack set at second level from the bottom. Bake 55 to 60 minutes or until a knife inserted 2 inches from the edge comes out clean. Cool on a wire rack before slicing. This pie can be made ahead and frozen.